The ability to non-invasively and dexterously manipulate cells and other microparticles is critical for a wide variety of applications in biology, chemistry and medicine. 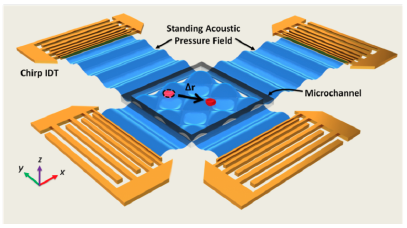 MRSEC researchers have developed a novel acoustic manipulation platform – acoustic tweezers – which can trap and manipulate single microparticles, cells and entire organisms along programmed routes in two dimensions within a microfluidic chip. “PSU” is spelled by moving a bovine red blood cell. The organism C. elegans can be manipulated and immobilized. With its non-invasiveness, miniaturization and versatility, these acoustic tweezers will become a powerful tool for many disciplines of science and engineering.